I just keep saying goodbye to one series after another this month. It’s oddly disconcerting. I’m starting to feel like some sort of book undertaker. To be honest, Sabina Kane series was never among my all-time favorites like Newsflesh or Sirantha Jax, but I still had a lot of fun with it, especially with book 3, Green-Eyed Demon. 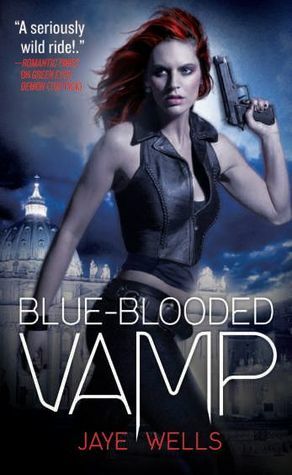 Blue-Blooded Vamp was all action, with a few delicious, swoon-worthy moments and a long sort-of-epilogue that was equal parts cute and annoying. But I’ll get to that later. I should probably tell you what the book is about first. Cain, the father of all vampires, is still determined to destroy everything Sabina Kane cares about, but even more, he’s dead set on kidnapping his love Lilith from Irkalla and bringing her to the mortal realm, a move that means certain death for all dark races. Sabina, driven by her need for revenge, embarks on a mission to find a mage who calls himself Abel in the hope that he’ll help her discover a way to kill Cain without killing everyone she cares about in the process. It is strange for Sabina to have that many beings she cares about. Until she met Adam and discovered that she has a twin sister, she never really got close to anyone. But the last year of her life changed it all and now she has people to protect and people to avenge. Not necessarily in that order. My lack of emotional connection with Sabina was never more painfully evident than while I was reading this book. I just never fully warmed up to her, and the only reason this series worked for me is the fantastic set of secondary characters. Luckily, there was always someone I actually cared about with Sabina, so that in the end, all the important moments had some weight for me. If it was a Big Thing between her and Adam, I was happy for Adam. If it was a lovely friendship moment between her and Giguhl, I was usually laughing too hard at something Giguhl said to notice Sabina was even there. To go back to the annoying part of the ending, it would seem that there is such a thing as TOO happily ever after. Gah. Who knew? Not only did Jaye Wells tie up all the loose ends, she tied them up a bit too neatly, in my opinion. Did I hope for a happy ending after five books? Of course. Did I expect it? Sure. But I just can’t get over how fairytale-ish it felt! I almost wished for someone to die horribly and permanently, just to spice things up a little bit. While it’s always sad to say goodbye to a series, I must say I think it’s the perfect time for it to end. These five books have been fun, but I have a feeling Jaye Wells’ next project will be amazing. Who knew there was such a thing as a too-happy ending? Ooh, ooh, me me me me me!! Hahaha. I feel like I'm complaining about that all the time - one of my biggest pet peeves. This is a month of final installments, it seems! Wonderful review as always. I read book one, and I found it kind of meh. Like you, I never really connected with Sabrina, but really enjoyed the secondary characters, mostly Giguhl. OOoh nice review!! I cannot wait to read this one! Sad to see it end as well. Also disappointed to hear that it has too easy of an ending. Still have to read it though! Once you're invested in a series and it's about to end, you gotta see it through almost!! Nice honest review too!! I cannot wait to read me some Giguhl! What? You don,T like Happily ever afters? Where everything is perfect!? IS THAT NOW REAL LIFE!? :D I'm totally the same though, I want people to die. I want emotions you know. Makes it more memorable. Or maybe I'm a masochist. AnyWays, this series has been on my TBR for ever! !